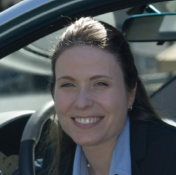 Susan’s interest in environmentally- and socially-beneficial technology applications led her to focus her doctoral dissertation on “smart” carsharing, linked to transit in the mid-1990s. She designed and tested the CarLink I and II pilot programs, using advanced technologies to support commuter carsharing services from 1997 to 2002. Carsharing has been proven to reduce auto ownership, energy use, and emissions and increase transit ridership, cycling, and walking. In addition, she has maintained an extensive database on carsharing trends in North America for over a decade. She is a co-director of the Institute of Transportation Studies’ Transportation Sustainability Research Center (TSRC) at the University of California (UC), Berkeley. She is also an adjunct professor in the Civil and Environmental Engineering Department at UC Berkeley. She was honored as the first Honda Distinguished Scholar in Transportation at the Institute of Transportation Studies at UC Davis from 2000 to 2012. She served as the Policy and Behavioral Research Program Leader at California Partners for Advanced Transit and Highways from 2003 to 2007, and as a special assistant to the Director’s Office of the California Department of Transportation from 2001 to 2004. She has authored 51 journal articles, over 100 reports and proceedings articles, three book chapters, and co-edited one book. She has also served as a guest editor for Energies and the International Journal of Sustainable Transportation (IJST). Her research projects on carsharing, smart parking, and older mobility have received national awards. In May 2010 and 2007, she received an “Excellence in Management” award from UC Berkeley. She has served on the ITS World Congress program committee since 2002 and was the chair of the Emerging and Innovative Public Transport and Technologies Committee of the Transportation Research Board (TRB) from 2004 to 2011. She is on the editorial board of IJST (2011 to present), a member of the National Academies’ Transit Research Analysis Committee (2011 to present), and chair of the subcommittee for Shared-Use Vehicle Public Transport Systems of TRB (2013 to present).